Last year it was Mary Engelbreit's teapot design gift wrap that I found on rolls and used to wrap most of my Christmas gifts. 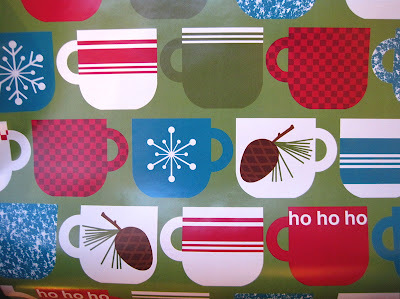 This year, it's this cute cup/mug design paper I found at Hallmark. Question here: Has your town lost its Hallmark store in the past year? Mine has. Two of them, actually. I knew one of them had closed, but a month or so ago I drove to the big "lifestyle center" in town, a vibrant shopping area, and the Hallmark store I'd frequented there for years was gone, just like that! So I traveled to neighboring Fayetteville for my annual purchase of Hallmark Christmas ornaments for all the children in our family. 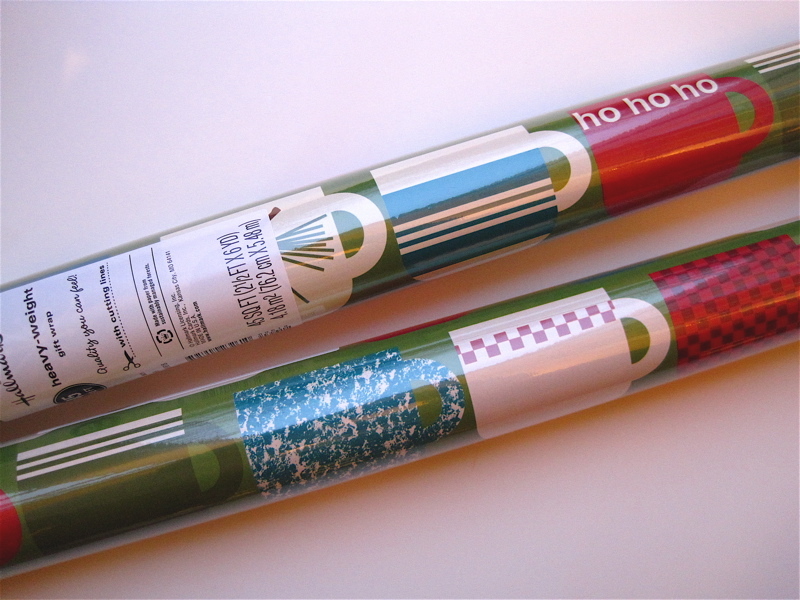 While I was there, I found this gift wrap. 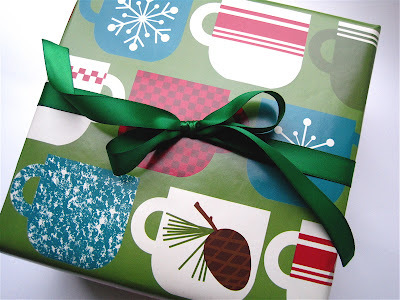 The annual Selection of the Gift Wrap is always a big deal for me, because I want lots of one paper that I will like to look at under the tree for all of December. It's like artwork or a nice throw pillow: I have to be able to live with it! And happily, it was on sale. It's regularly $4.99 a 45-square-foot roll, but you could buy a roll and get a second roll for 99 cents. 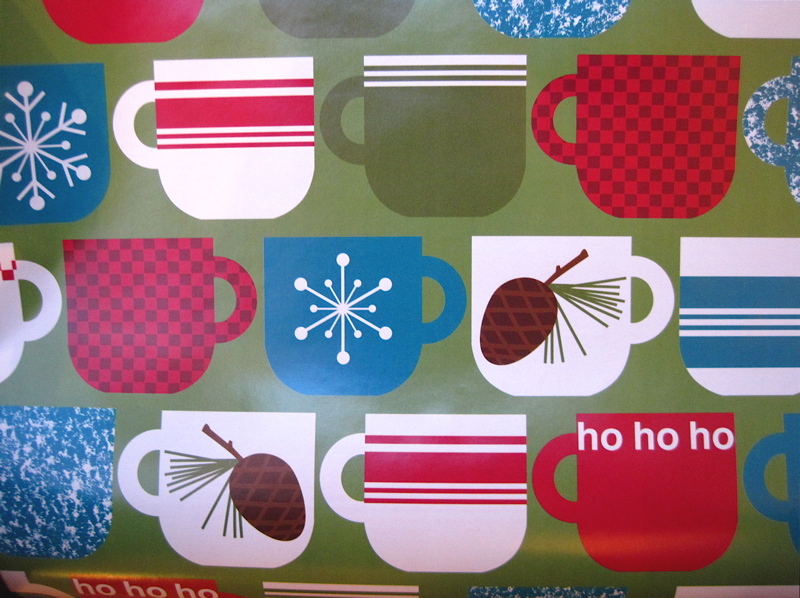 So if you'd like some of this gift wrap for your tea-themed (and other) Christmas gifts, you might want to visit a Hallmark store—if you are lucky enough to still have one! 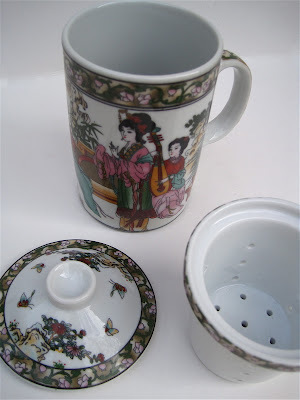 A china tea mug—from China! 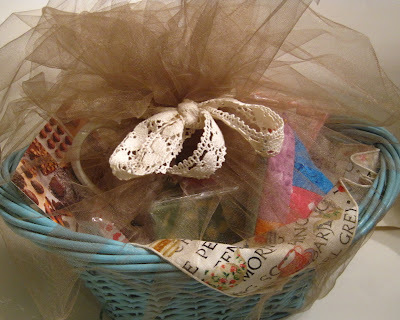 A few Sundays ago at church, my friend Judy handed me a small gift bag and said, "Here. It's nothing, really. It looks like it came from the dollar store, but it really did come from China." Judy had recently returned from a trip to China, so I was curious to see what was in the bag, and it was this delightful tea mug! 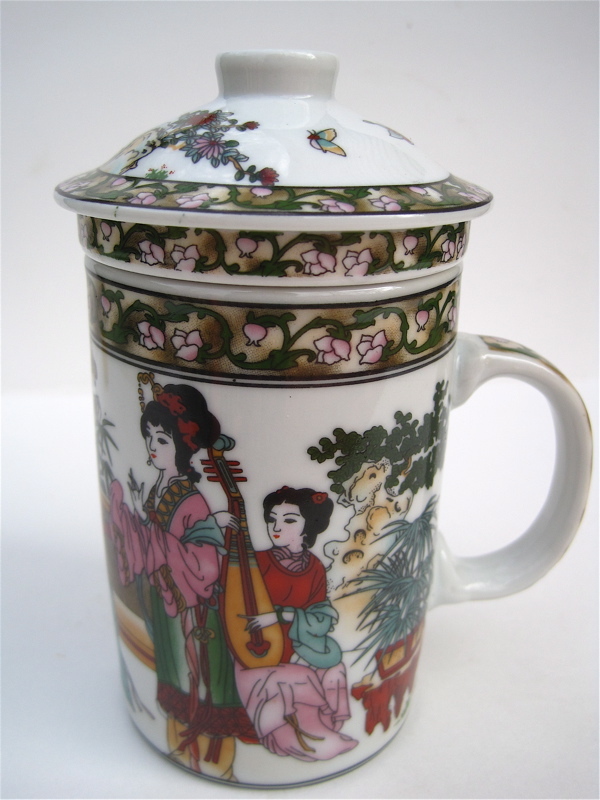 Frankly, if I am going to get a souvenir from China, I'd like it to LOOK like it came from China, and this does! 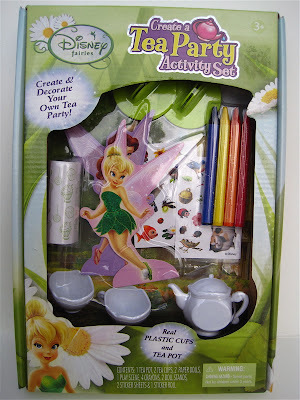 I especially liked that it came with an infuser and a lid. 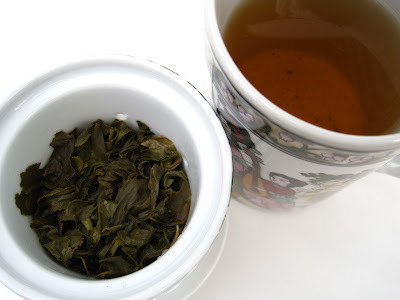 I decided some oolong would be a fitting tea to make in my new mug, and it was. 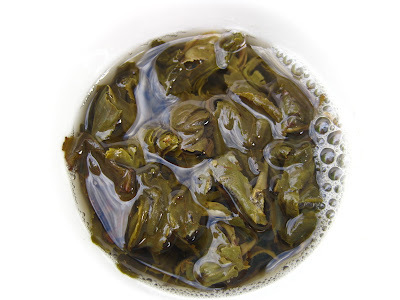 Don't you love watching the tea leaves unfurl in the hot water? The leaves were actually pretty large and only a little of the tea fannings landed in my cup, so I was quite pleased with the way this new tea mug works. And somehow, knowing a friend was thinking of me with the gift of this mug even makes the tea a little sweeter! Loretta J.! 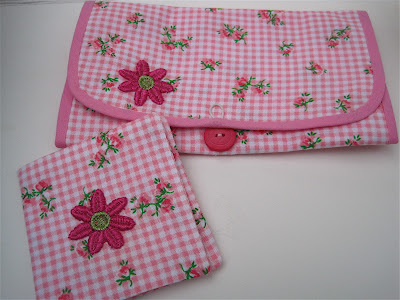 If you'll send me your snail mail address via the e-mail button at right, I'll get this off to you. Congratulations! 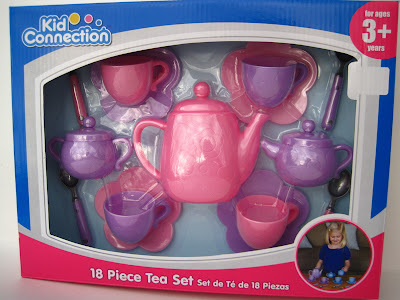 If we're going to shop for toys anyway, I say why not look for some that promote teatime! 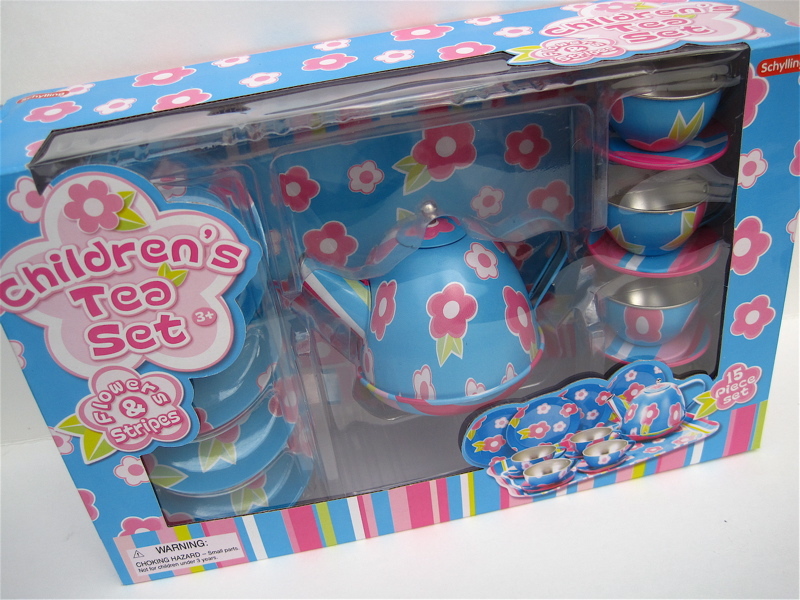 Whether you have little girls on your shopping list of family and friends, or perhaps you're simply buying something for a local toy drive, looking for tea-themed toys can certainly make you feel like a kid again! Here are a few I've found so far this year. First, this little tin set from Marshalls reminds me of the old-fashioned ones that once were so popular. This Disney Fairies Tea Party Activity Set came from Family Dollar and, I must confess, I was tempted to keep it for myself! I actually think I might enjoy coloring my own teapot and decorating it with stickers. But then a little girl would probably enjoy it more, right? And finally, this set came from Walmart, and I thought the matching pink and lavender spoons made it a winner. Have you bought any teatime toy sets this year? 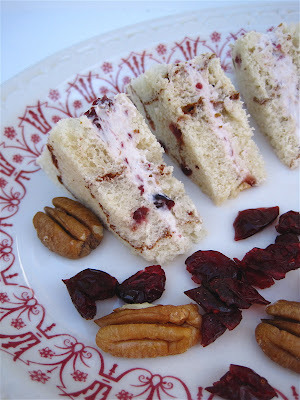 My husband walked in the kitchen just as I was finishing up this week's tea sandwiches. "Those look almost like turkeys!" he said brightly. "Almost?" I said. "ALMOST?" Being the smart man he is, he immediately changed his tune. "I mean, they look JUST like turkeys! Exactly like turkeys!" Indeed. 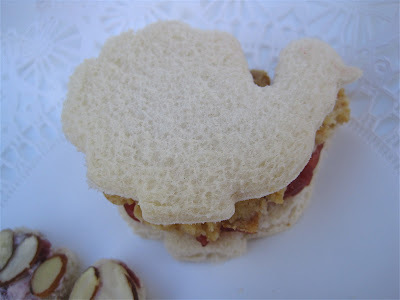 Actually, I do realize my artistry here could use a little finessing, but I absolutely *love* sandwiches made of Thanksgiving leftovers and didn't see why they couldn't be adapted for teatime. I first discovered the turkey/dressing/cranberry sauce sandwich several years ago at a Boots drugstore in London, of all places. I couldn't imagine why you'd want to pile all that between two slices of bread, but out of curiosity I got one of the sandwiches and loved it! The only problem is, only once a year do you have all the proper ingredients. Fortunately for me, my sweet sister, who hosted us for Thanksgiving on Thursday, let me take home some of her (wonderful!) leftovers so I could try to make tea sandwiches. 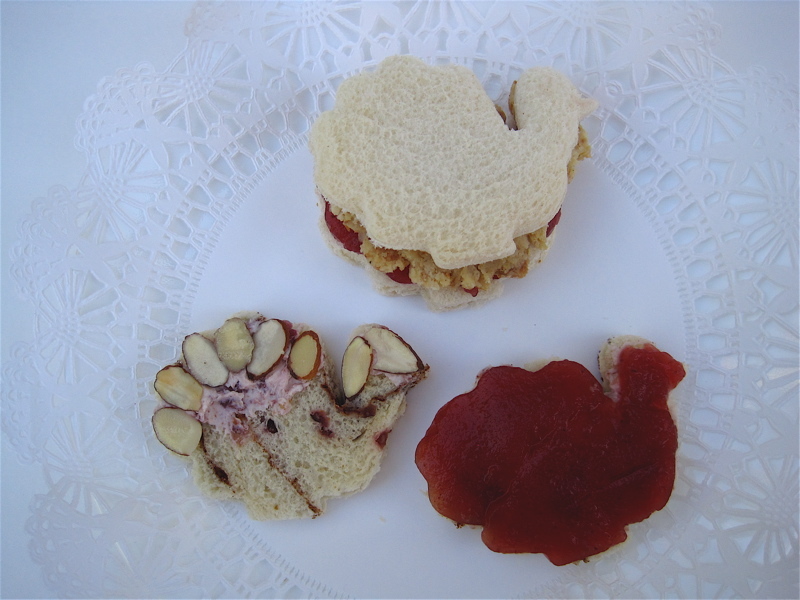 The "leftovers" tea sandwich was made with white bread, and for the other two I used the Pepperidge Farm cranberry swirl bread with cranberry sauce on one, almond slices on the other. I tried to completely outline one whole slice of bread with almonds, but it ended up looking like a lopsided heart so I ditched that idea. So if you haven't eaten up your Thanksgiving leftovers just yet, give the "leftovers" sandwich a try. You just might be surprised! 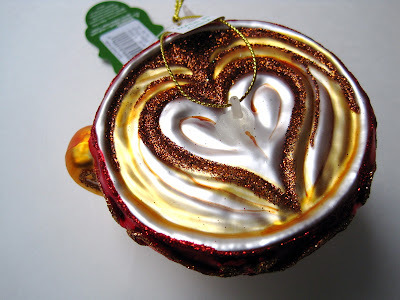 A Black Friday Tea Giveaway! Much as I love to shop, I don't do Black Friday. No thank you, no siree, not for me. (Except, on some years, antique malls. 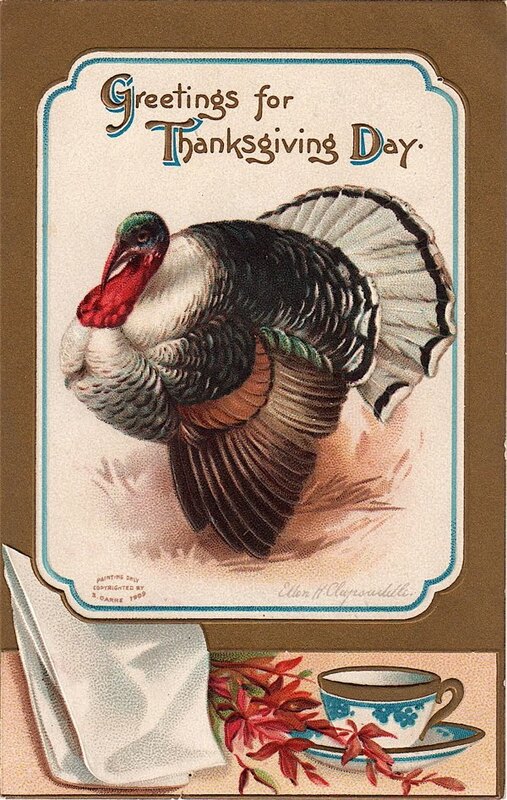 Those are generally sane and safe places to visit the day after Thanksgiving.) So instead I'll be at home today breaking out some of the holiday teas the Stash Tea people recently sent me. 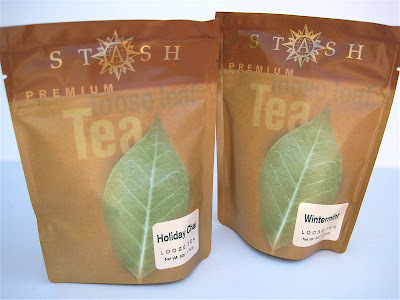 It didn't seem right to tuck into them until after Thanksgiving, so today I thought I'd tell you about Wintermint, which I'm keeping, and Holiday Chai, which I'm giving away to one of you! 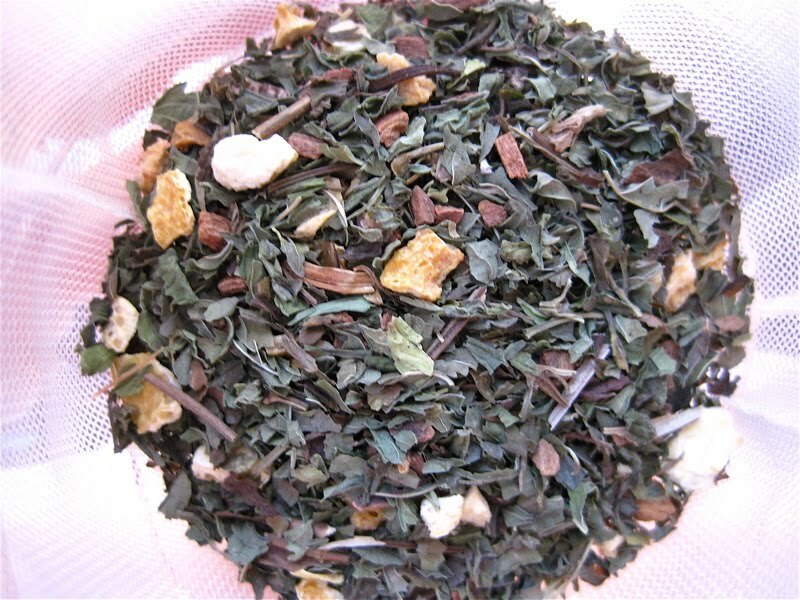 The Wintermint loose tea is a new one to me, and it is delightful! 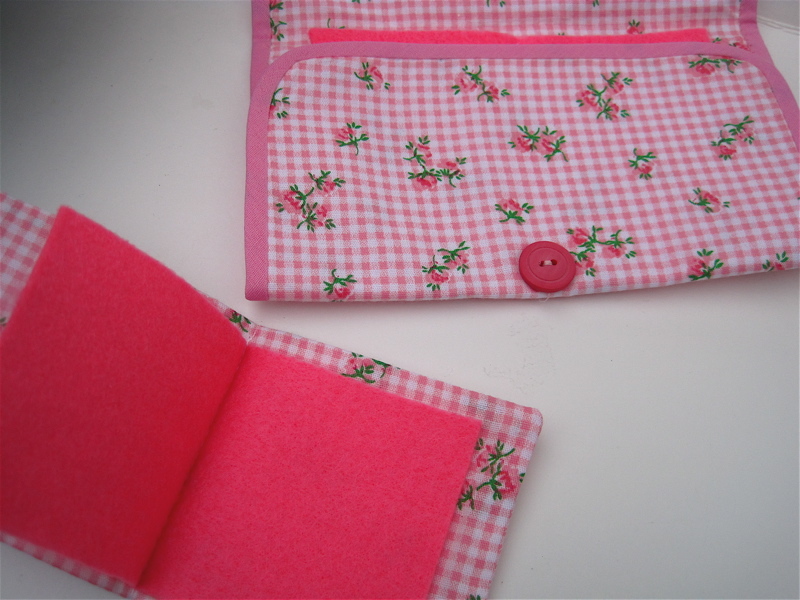 Pretty too, as I hope you can see here. 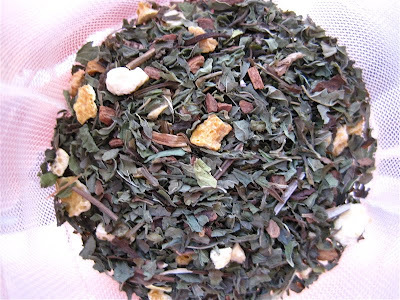 This blend contains spearmint, orange peel, cinnamon, parsley seed, sarsaparilla and natural flavors of wintergreen and peppermint. It's just as minty as I'd hoped, and I was also happy to find I can steep the tea twice (at least) and still have plenty of flavor. The Holiday Chai is a blend I've had and enjoyed before, so I thought I'd share it with one of you! 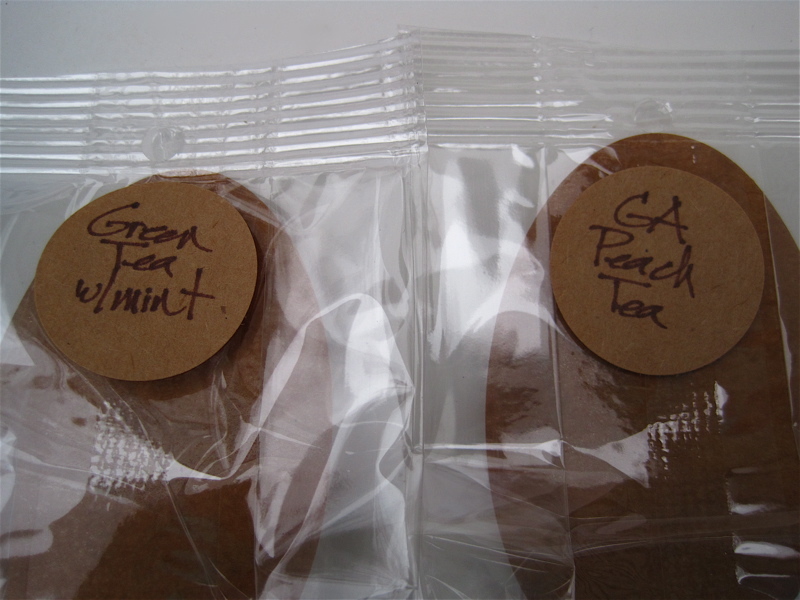 This 50 gram bag is a blend of black teas, cassia, ginger, clove and natural flavors of gingerbread, Jamaican rum and nutmeg. If you'd like to win, just leave an "Enter me" between now and 7 a.m. EST Monday, Nov. 28, and you may be the winner. Good luck! 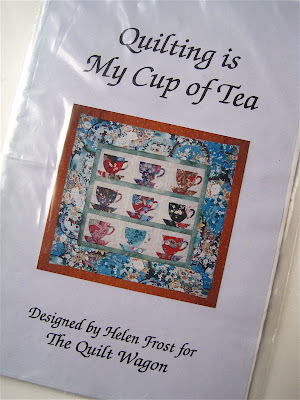 A tea & quilting surprise gift! 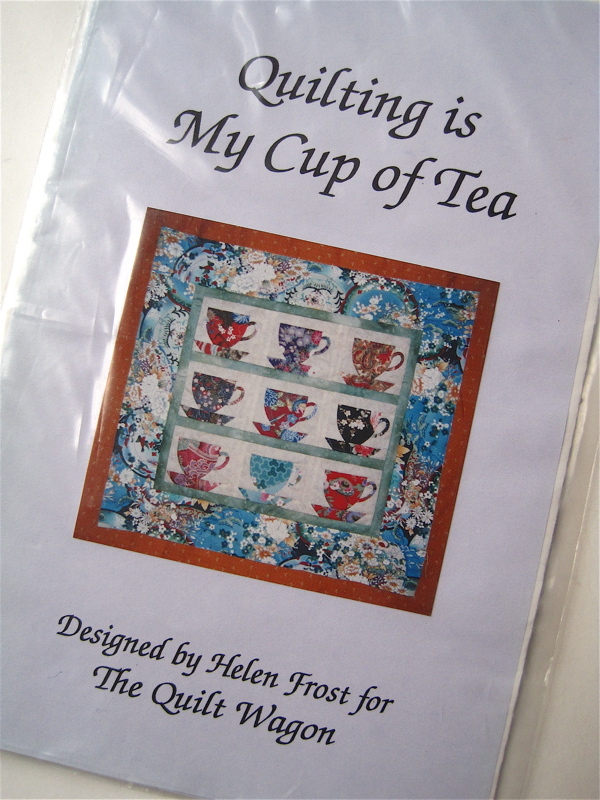 So last week I was to have a tea-and-quilting themed week without even realizing it! 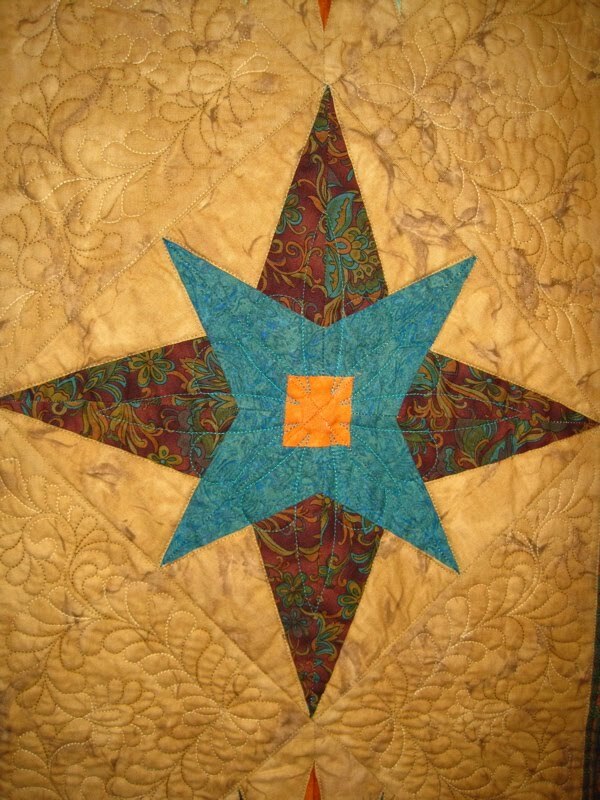 Monday: the quilt guild meeting and quilting inspiration galore. 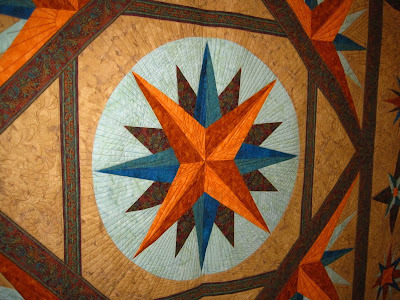 Tuesday: a visit to a new quilt shop and the discovery of a cute teacup pattern. Wednesday: I arrived home and found this great bonanza of goodies had arrived in the day's mail! 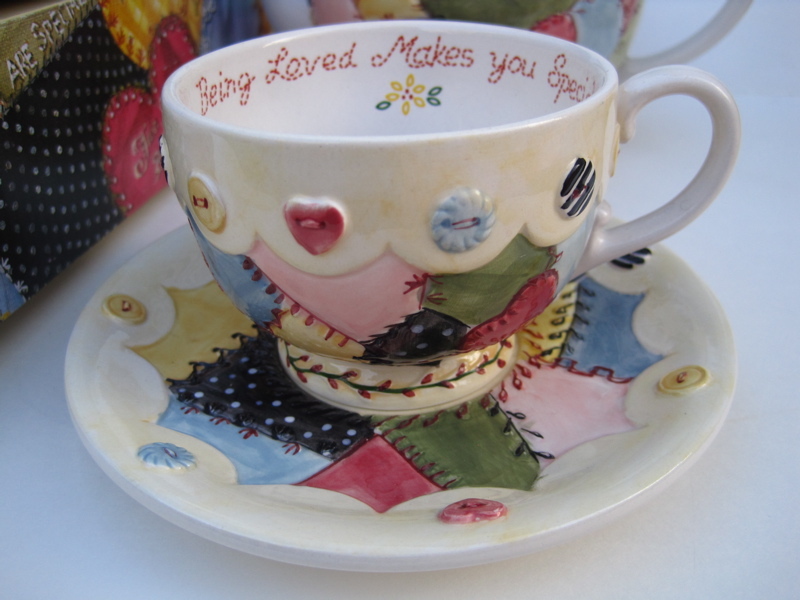 My tea friend Phyllis had e-mailed that she was sending me a gift to celebrate the publication of my book. 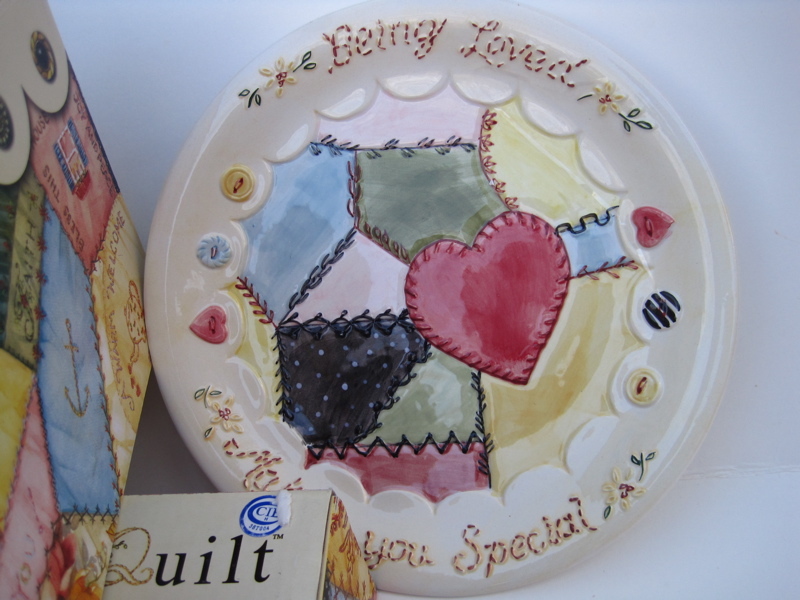 Now, really, Phyllis has done so many nice things for me over the past few months I ought to be sending her a gift, but still, I was delighted to find her package had arrived and could hardly wait to open it. Inside were these beautiful quilt design teawares from Sandy Lynam Clough! I'm a great fan of Sandy Clough's tea-themed artwork, and some years ago she had a business where her designs were sold at home parties. The business didn't last very long, and these pieces are no longer available except (rarely) on the secondary market. Turns out, Phyllis had been a tea lady for this line and she wanted me to have these pieces from her collection! W-O-W. Just wow. How perfect that quilt design teawares including this delightful teacup had come my way! 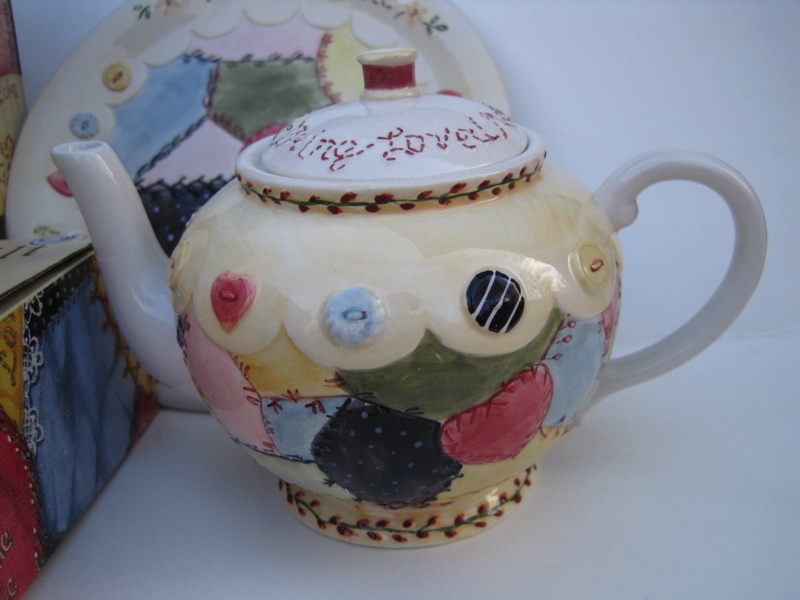 And the teapot, too! I was so tickled I rearranged a coffee table in the living room so these will be out on display. They read "Being loved makes you special," and indeed I felt special for receiving such incredibly generous gifts! 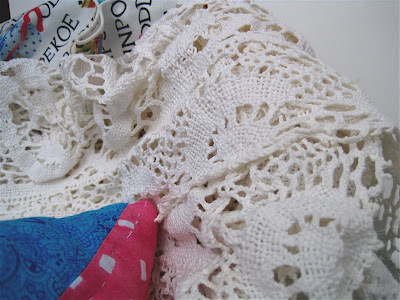 Really, it's hard to believe all the great goodies that were in my gift basket from the Common Threads Quilt Guild last week (see yesterday's post for the first half). This pretty artisan soap slice is resting on the basket's liner, which was a gorgeous design featuring lots of names of tea splashed with colorful teawares. I'm not sure how I'm going to use this fabric, but I definitely want it used in some project where it will be spotlighted! 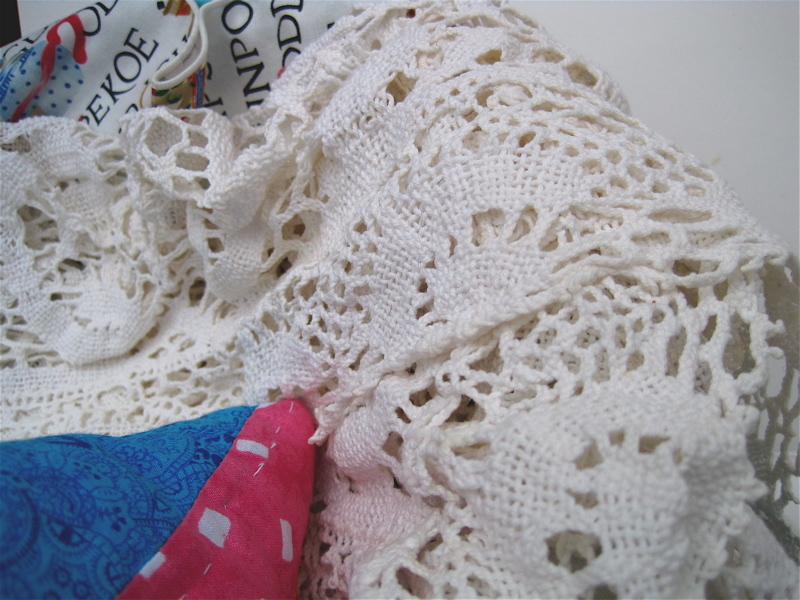 Also hanging over the basket edge was this vintage lace dresser scarf. 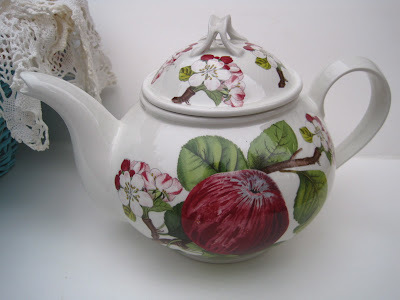 I am going to use it under my pink feather tree with all the teapot and teacup ornaments this Christmas! 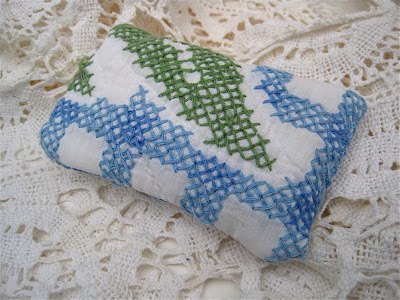 There was also a lavender-filled sachet made from an old cross-stitched quilt. What a charming idea! I don't know who made these great needlecases, but I was awfully happy to receive them—and in my favorite color! 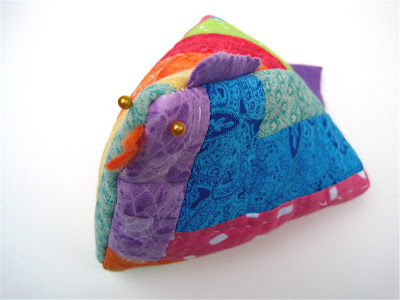 I also like this fun and funky pincushion and will put it to good use with my winter needlework. I really do adore handmade gifts and treasure them for the time and care that go into them! In my day job as a magazine editor, I am sometimes called upon to attend local functions, usually to judge some sort of contest or perhaps give a speech. Last Monday, I was delighted to be asked to attend an event where I would just show up, have fun, do one tiny thing, and I didn't have to prepare any remarks at all! This beautiful quilt is the annual Opportunity Quilt raffled off by the Common Threads Quilt Guild to support their many charitable efforts, and I was asked to draw the winner's name. How fun is that! When first asked several weeks ago about drawing the winning name, I had to assure the guild I had not, in fact, purchased a raffle ticket myself. 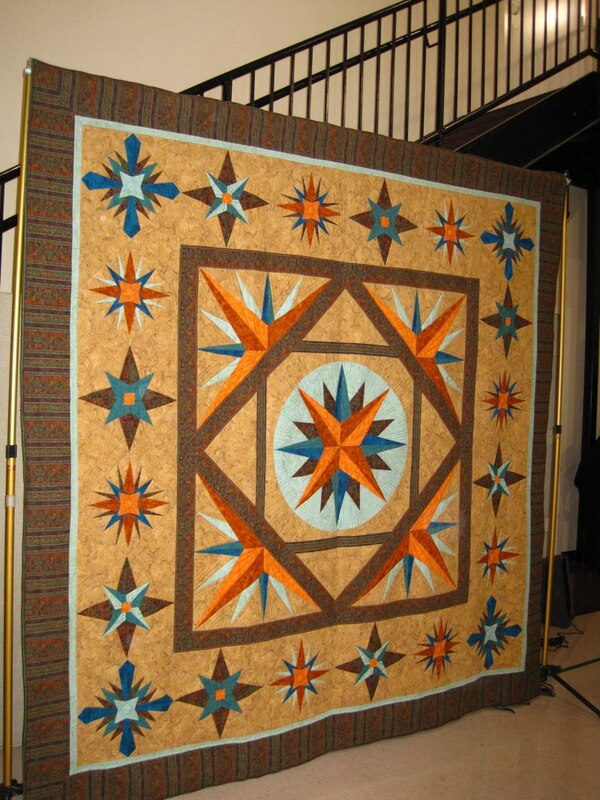 After seeing a photo of the quilt, I was sorry to say I had not, but at least I would have fun on the night the quilt winner's name was drawn. It looked pretty on the website where I first saw it, but "live" it was even more impressive. Here's another closeup of the design. 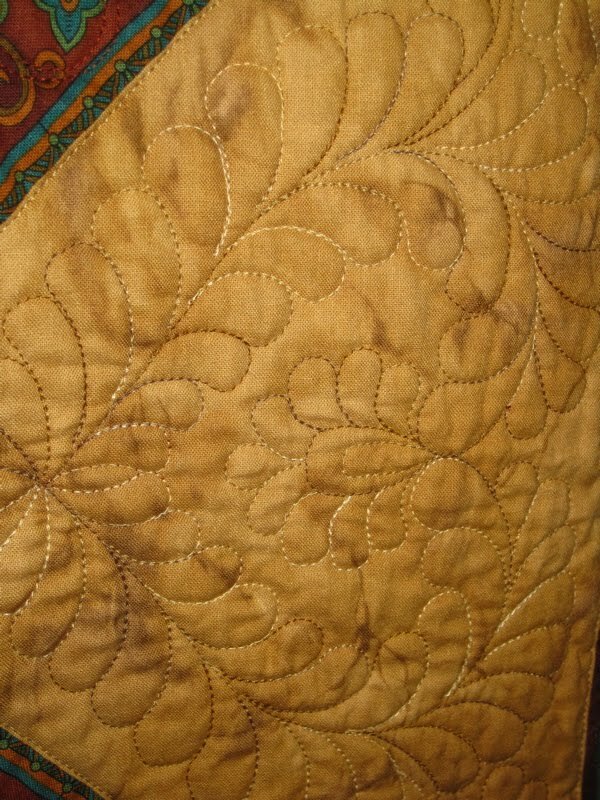 Isn't this feathery quilting beautiful? It was just a gorgeous, gorgeous quilt with vibrant fabrics and lovely stitching. And again, all I did was draw the name, and the club president presented me with this amazing gift basket of goodies. Let me assure you, never has a woman received so much for doing so little! Of course chocolate is always a welcome treat, and these chocolates introduced me to a maker I'd not heard of before, Chocolate South. Aren't they pretty? I've always wanted to sample some of these elegant-looking chocolates to see if they taste as good as they look. The answer: Yes! And guess what the flavors were? Green Tea with Mint (the green ones) and Georgia Peach Tea (with the hearts)! 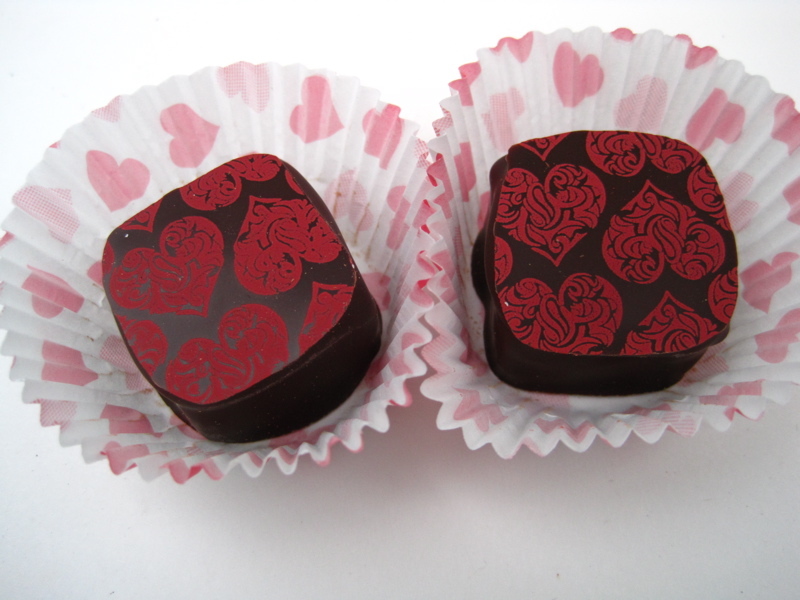 Both varieties were so rich and creamy and fresh tasting, and I enjoyed them very much with my evening cup of tea! 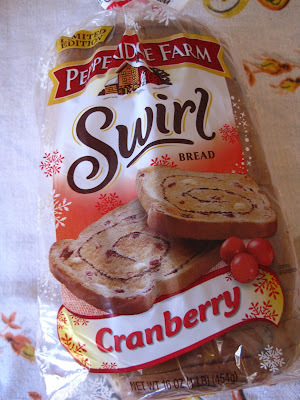 A few weeks ago when I wrote about finding that Pepperidge Farm Pumpkin Spice Swirl Bread, a reader named Marie noted that they also have Cranberry Swirl Bread near the holidays, so I've been on the lookout and the bread has arrived at my local Publix. To go on it, I decided to make an easy spread that would make a nice sweet type of tea sandwich suitable for serving at a Christmas tea party I'm planning. 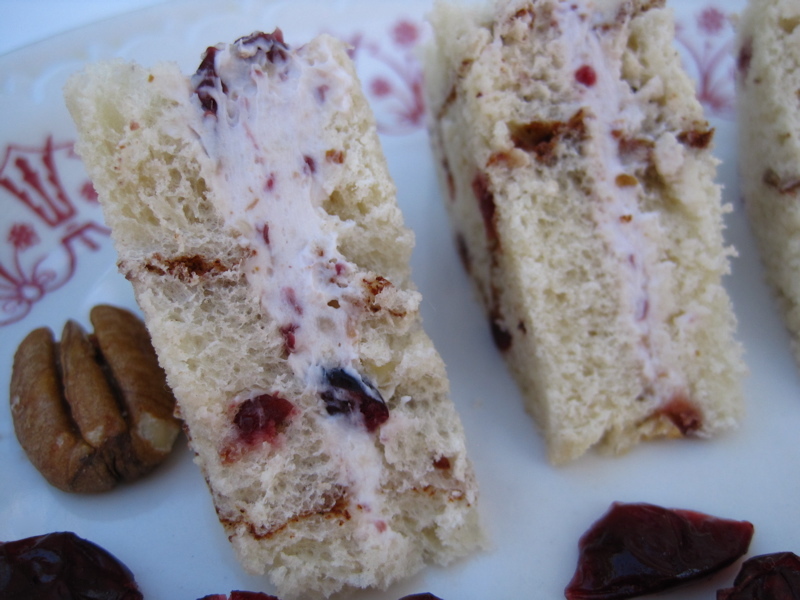 This recipe really couldn't be any simpler: cream cheese, dried cranberries, pecans. (And Swirl Bread.) That's it. 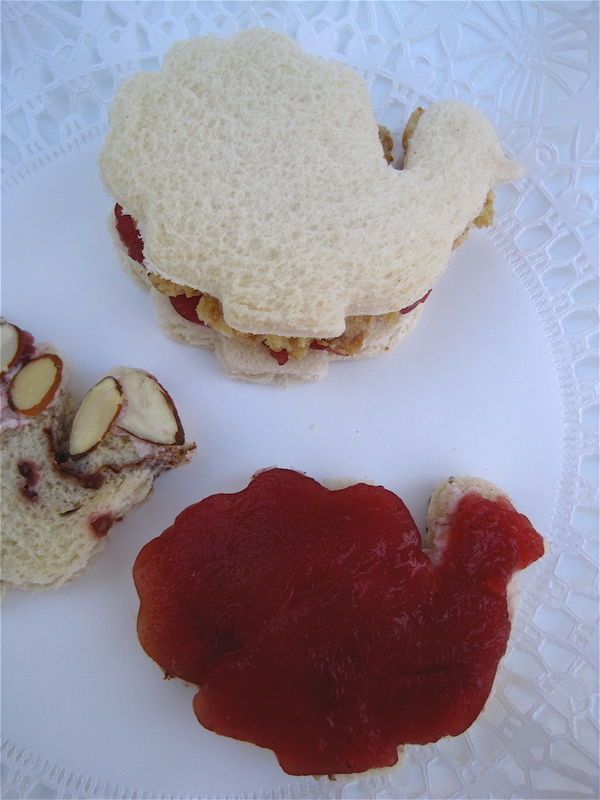 I made triangle-shaped tea sandwiches, but this bread is so pretty (and tasty! ), I think it would look nice in any shape you decided to use. 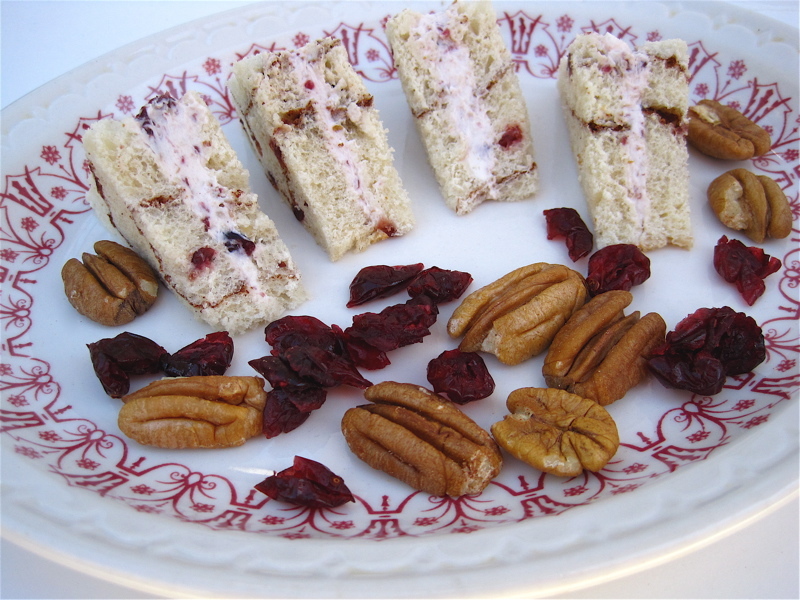 The spread ends up being a soft pink shade, and you can clearly see pieces of the cranberries and pecans, which I think play nicely against the Swirl design of the cranberry bread. 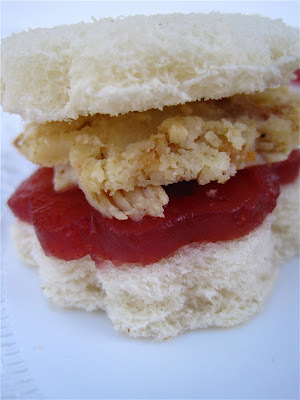 Combine all ingredients in food processor and pulse until mixture has a light, whipped texture. Yields 1 cup of spread. Drum roll please ... Kiffer! And since I have your address already, I will get this posted to you ASAP! Congratulations! 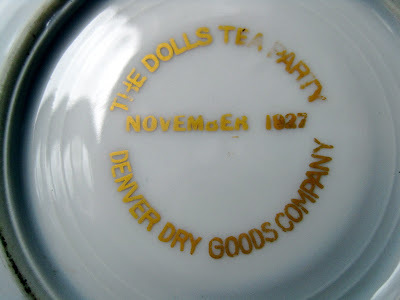 In my research of department store tea rooms, one of the lovely tidbits I learned was that some stores sponsored an annual tea party for children (presumably little girls) and their dolls. 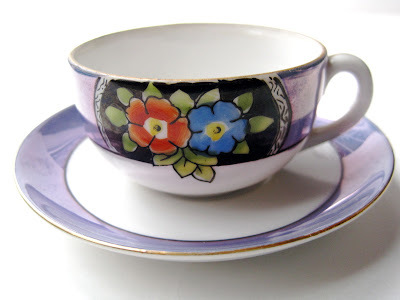 One of my recent online finds was this set of two tiny teacups and saucers, mementos of the Dolls Tea Party at Denver Dry Goods in Denver, Colorado. Each teacup is about 1-1/4 inches high, and the saucer is 3-1/2 inches in diameter. 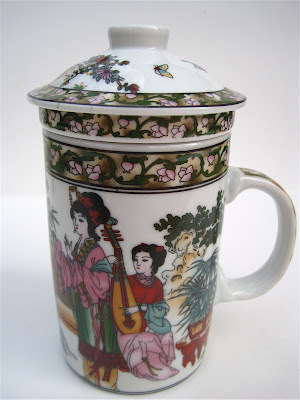 The backstamps of the teacups reveal these were made by Noritake in Japan. The top of the saucer says "In Remembrance of ..."
... and the rest of it says "The Dolls Tea Party, November 1927, Denver Dry Goods Company." 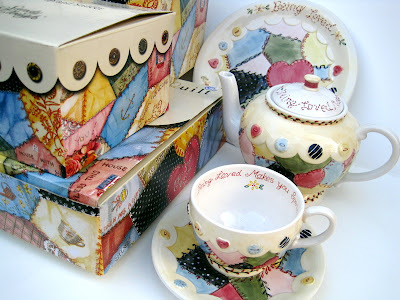 I also have another set which came from a Dolls Tea Party at Emery, Bird, Thayer in Kansas City, and it is shown here. Wouldn't it be great if these were still treats for little girls (and, ahem, some big girls too) today? Now that's what I would call a Happy Meal! 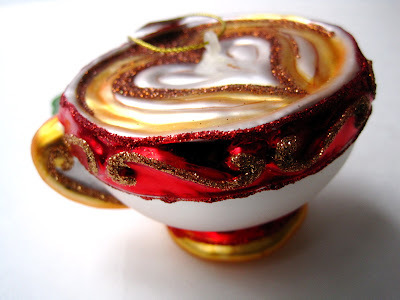 Friends, I have found slim pickings on the teacup and teapot ornament front this year. The few designs I saw at HomeGoods last month I already have. I've checked T.J. Maxx and Marshalls, Walmart, Target, Hallmark, Michaels, Hobby Lobby—all my usual haunts and they've turned up nothing but one silver ornament I found at JoAnn. 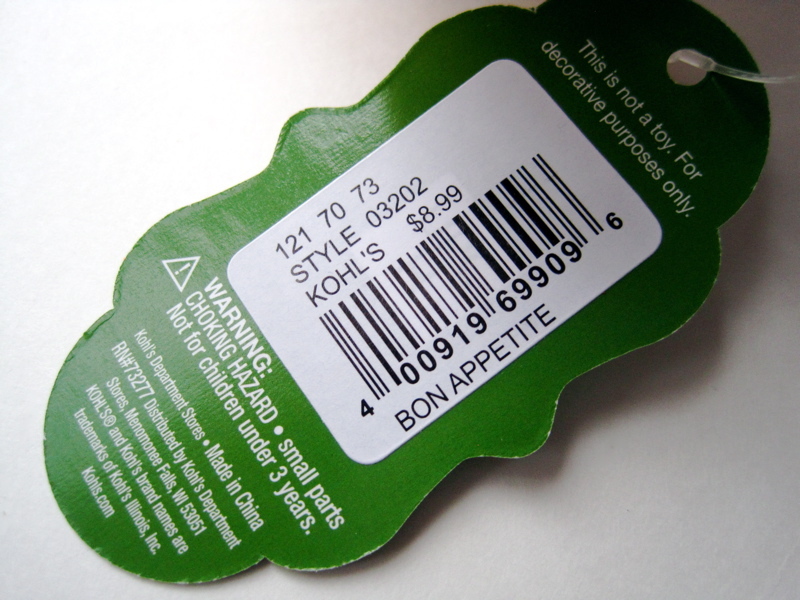 Kohl's, I am happy to report, has a new glass ornament that should make some of us very happy! 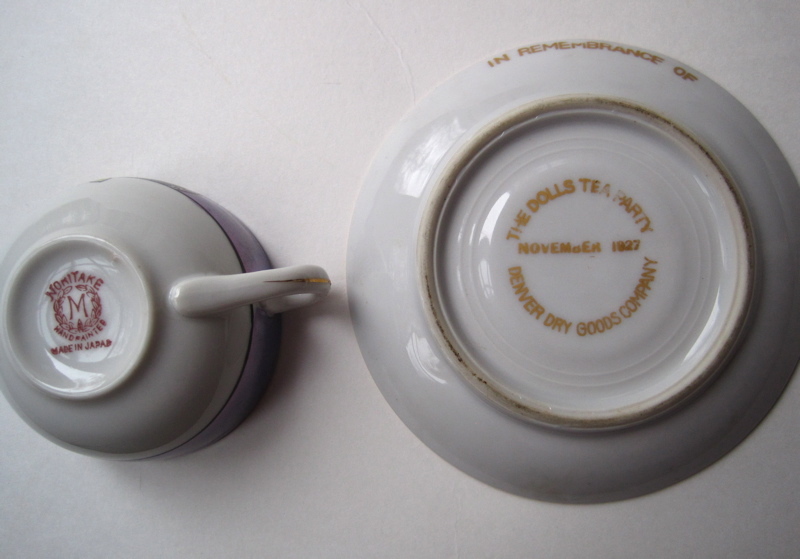 I've seen designs similar to this one that say "coffee" or "java" or something like that, but this one isn't labeled and theoretically *could* be tea, if we had tea with decorative milk or cream and perhaps a little cinnamon added. I'm laughing with Reese Witherspoon, I say, not at Reese Witherspoon! 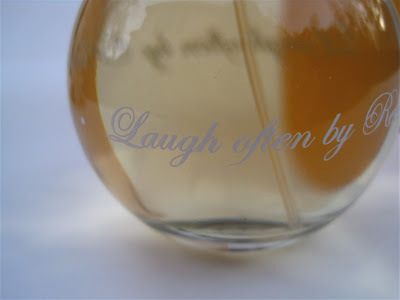 Because after enjoying her In Bloom fragrance for Avon, I've discovered yet another tea-inspired fragrance of hers, Laugh Often. 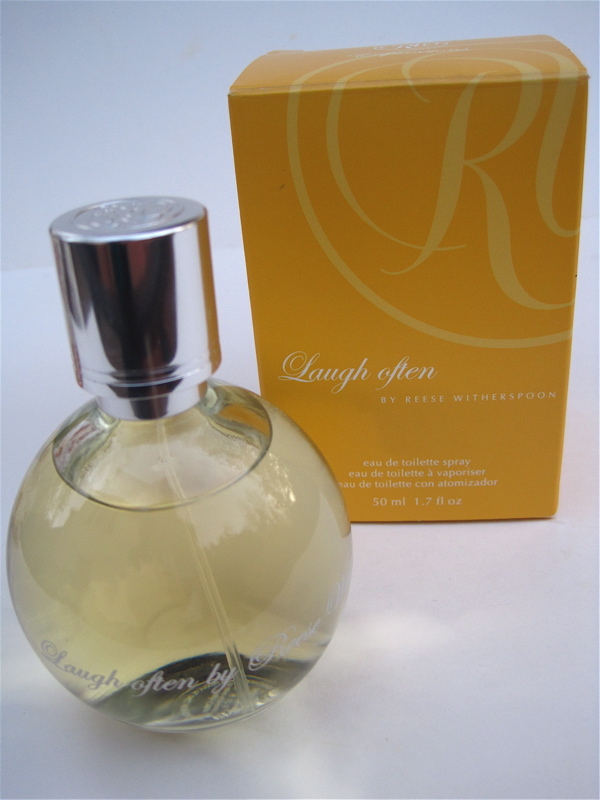 Laugh Often was recently on sale in the Avon catalog for just $10, so I had to try it. 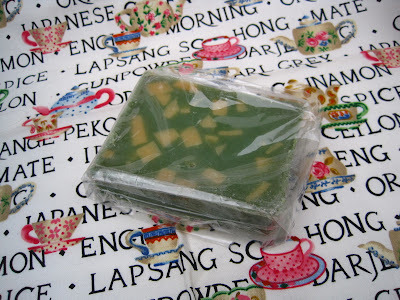 The box describes it as "fun and joyful ... a spontaneous burst of bright mandarin wrapped in green and white tea leaves and playful pink peony." And indeed it is a fun fragrance! It's just as floral as it sounds, and it has a lighter scent than In Bloom, so now I'm alternating between the two. 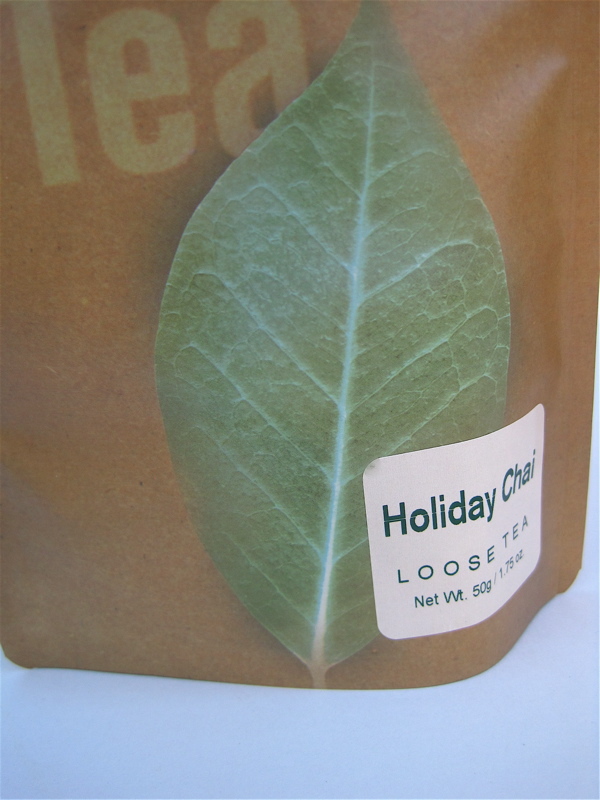 If you're like me and already Christmas shopping, this might be a good suggestion for the tea lover on your list—or yourself! "Dainty Dining" and "A Year of Teatime Tales"
Click image to "Follow" me on Amazon or to purchase either of my tea books! 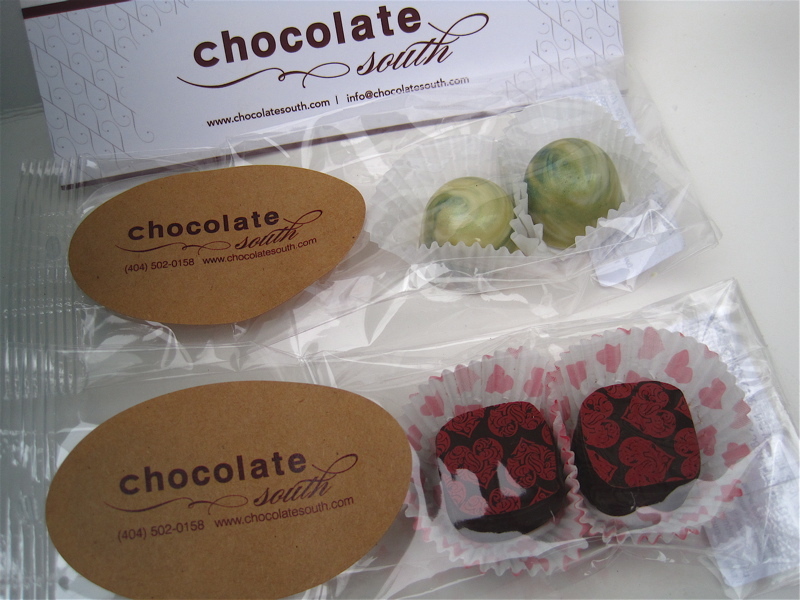 Rent snack sets to benefit charity! 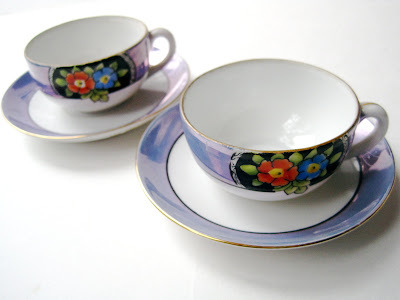 Click card above to learn how you can rent vintage snack sets from my friend Nancy and support the Leukemia Society! Time for a tea giveaway! The dishes of "Dainty Dining"
Lots of interest in Pinterest! A tea gift from Iraq! Text and images on this blog may not be used or distributed without the express written permission of the author.